Alton Brown is notorious for his dislike of single purpose kitchen utensils. There are a couple that he’ll allow into his kitchen but most are verboten. I found only one recipe of his that used tofu, and he recommends balancing canned tomatoes on the brick for an hour (FYI – The recipe is not vegan). With all due respect Mr. Brown, I bow to your superior culinary knowledge, balancing anything on a brick of tofu for an hour is quite a feat. I say that as some one who has tried many, many times. Being an omnivore Mr Brown probably doesn’t eat enough tofu to fully appreciate all the subtle nuances that a properly pressed block a tofu presents the chef or how it feels on the palate. However if he knew there is a way to perfectly press tofu and do so in less, much less, than an hour, he might be persuaded to add today’s gift to his kitchen. We first reviewed the E-Z Tofu Press last April and I’ve used it regularly to not crush bricks tofu since then. Todays lucky reader will receive their very own E-Z Tofu Press. 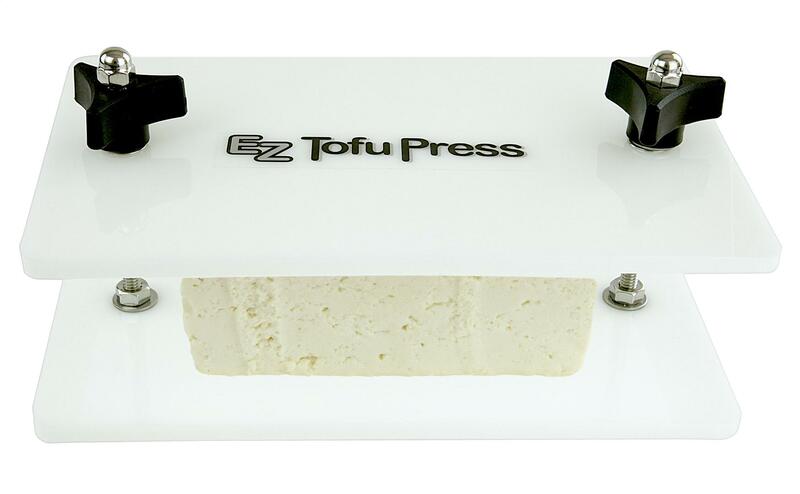 For those who aren’t as lucky today, you can buy an E-Z Tofu Press for the nice vegans on your holiday list here. I would love this! I love tofu but I’m too inpatient to wait for it to press properly, and it is such a hassle balancing a bunch of stuff on top of it. I eat out too often but this might encourage me to stay home and eat more tofu! Trying to find one of these in wisconsin is UNBELIEVABLE. People don’t even know what they are or what I’m talking about 😦 I would love one of these for Christmas!!! !